GULF FRONT with large POOL! Private Beach Access. Sleeps 26! Beautiful Gas Grill! Sol Mate is a lovely, two-story vacation home that offers breathtaking views of the Gulf of Mexico’s emerald green waters. Enjoy 50 ft. of private beach exclusive to this home from your own personal private beach access. Upon entry you will be greeted by Sol Mate’s spacious open floor plan with the kitchen, dining and living areas blending seamlessly together. This tranquil and serene living space echoes the sugar white sands of the Emerald Coast with all-white walls and furnishings. The living space features 3 sleeper sofas. The formal dining area provides seating for 8 guests. Additional seating can be found at the breakfast bar by the kitchen or at a second bar space which offers seating for 4. The open and bright kitchen is fully-stocked, has stainless steel appliances and features an island for extra prep-space. For sleeping arrangements on the first floor, there is a King Suite with a private bath and a media/game room with a twin-over-queen bunk bed. Along with the bunk bed, the media/game room includes a foosball table, television, and dart board. On the second floor you will find all King Suites, and a sleep quarters with 2 Queen beds. Each of the elegant King Suites come with beautiful gulf views, one has a private bathroom and the other has a shared bath. The first King Suite features a unique wicker headboard — wicker being a classic and tasteful material for coastal, beachfront furnishings. The Master King Suite includes a gorgeous 4-poster bed, walk-in closet, balcony access, a private bath and a twin-over-queen bunk bed. This room sleeps 5 guests. The master bath features a walk-in shower and large garden tub. “Sol Mate” is sure to provide the peaceful, sunny retreat of your dreams! 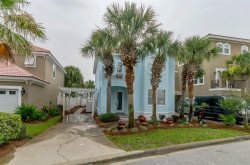 This home is within minutes to grocery stores, Silver Sands Outlet Mall, beach front restaurants, and many other attractions. *Weddings/Events – All weddings and events held at this home require a $500 event fee. *Tents/Canopies- Are permitted on the beach. **This home rents ONLY Saturday to Saturday during Spring Break and Summer Months. Please call our office if you have any questions. **Walton County is now requiring a permit in order to conduct a wedding ceremony on the beach. It is the guests’ responsibility to secure this permit. Walton county will fine at the time of the wedding if you do not have the permit. Seasonal Beach Chair Service - Our complimentary seasonal beach service is offered for our Spring and Summer 2019 months. This includes 4 chairs and 2 umbrellas set up daily on the beach from 9am-5pm. Our Season begins on March 1, 2019 and ends October 31, 2019. Complimentary seasonal beach service is offered for our Spring and Summer 2019 months. This includes 4 chairs and 2 umbrellas set up daily on the beach from 9am-5pm. Our Season begins on March 1, 2019 and ends October 31, 2019.